Organic bread baking, traditional cold meats recipes, green cosmetics and organic products for home - these and many other products for conscious consumers are presented at the Targi Kielce’s Eco-Style expo stands. Visitors to the previous edition of the fair have appreciated the exhibition development direction towards global ecological and lifestyle trends. The organic, natural and traditional food trade show attracts nearly 20,000 visitors. For consumers this is a unique opportunity to become familiar with a wide range of products of green, top-quality products. However, what is most important is the the possibility to meet the producers. The healthy food stalls showcase unique, home-made products and making processes’ details. The Polish Ecology Association’s stand is a real magnet - this is where they make bread from organic cereals, spiced up with unique natural flavours, such as charcoal. Not only can visitors observe the bread baking process live. They can also taste these unique breads. HEALTHY BREADS MADE AT TH ECO-STYLE EXPO! The Organic Products Exhibition in Targi Kielce welcomes guests for the whole weekend. The zone of culinary demonstrations in the A Expo Hall is the stage for live presentations. Come and see how to how to bake wholemeal bread with ... charcoal! 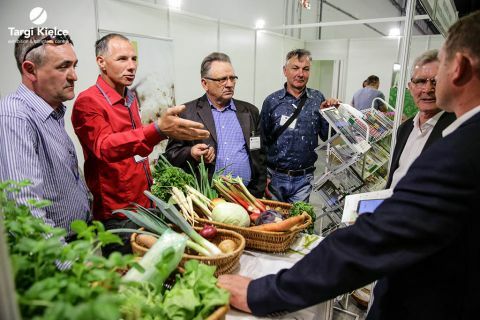 At high noon on April 22, the National Centre for Agricultural Support, Regional Department in Kielce invites you to join the conference on "How to make organic farming successful? Production, sales, marking"
MOUTH-WATERING ECOLOGICAL PRODUCTS - CULINARY WORKSHOPS AND SHOWS!